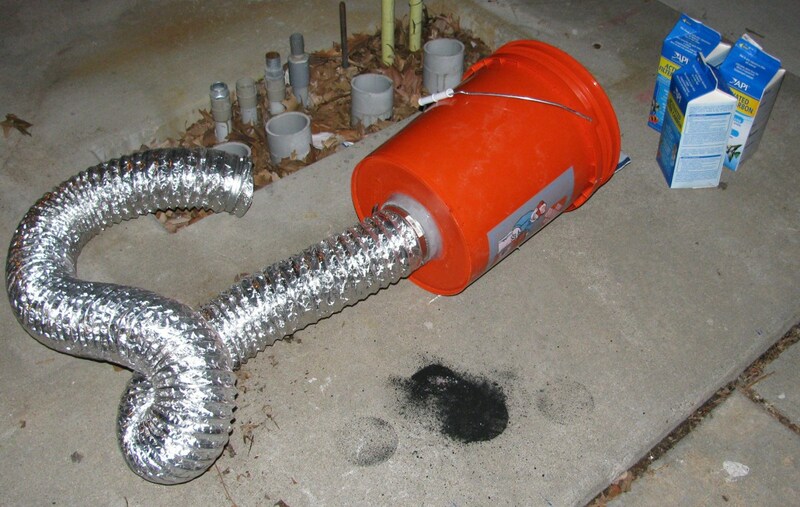 The setup consisted of a 5 gallon bucket with rubber seal to form the main enclosure, a 3 gallon bucket to hold the carbon, a plastic coffee can, some thin aluminum screen, 4" OD toilet anchors to act as ports, and a tube of silicone caulk to seal everything up. All components, except for the active carbon itself and the coffee can, can be found at a Home Depot for about $20. Basically, I took the plastic coffee can, cut the sides out, and added some screen held in place with silicone to be my innermost support. For the 4" port on the bottom, I used a toilet anchor and cut 4" holes through the bottom of a 5 gallon bucket and a 3 gallon bucket and sealed everything up with silicone. A small ring of PVC that press fit the 4" OD toilet anchor was added for mechanical support (you can kinda see it in the pic where the 4" ducting is installed below). 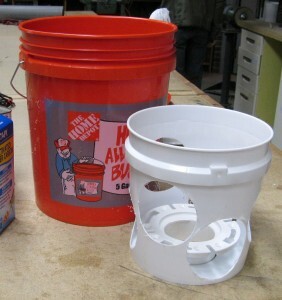 The 3 gallon bucket was used to form a support cage which screen was attached to, much like the coffee can, but this time the holes were cut with the same 4" hole cutter that was used to make the holes for the 4" inlet (toilet anchor). 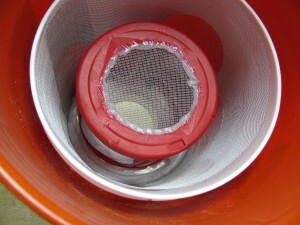 The active carbon is poured in to the 3 gallon bucket and forms an envelope around the coffee can. 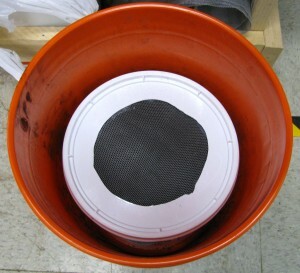 Once filled, the 3 gallon bucket lid is installed. I probably took a little too much material out of the sides of the 3 gallon bucket, as it was a little difficult to get the lid on it because the sides kept collapsing a bit. It took a little less that 3 quarts of active carbon to fill the void in the 3 gallon bucket (about 60 oz. by weight). I was surprised that very little of the active carbon actually made it through the screen (a little less than a tablespoon) while filling. After filling, I attached a 4" hose to the inlet and sucked some air through the filter (I would suggest you do this along with filling the filter outside) with a small dust collector motor. Airflow didn't seem particularly impeded by the filter so it should work well with the dust collection system in the shop. In normal operation, air from the laser cutter would come in the coffee can where it would pass through 1.5"-2" or more of active carbon between the 3 gallon bucket interior and the coffee can exterior, then out the lid of the 5 gallon bucket. I'm eager to actually put this thing to the test here in the next 2-ish weeks and see if it actually works for filtering out the nasty gasses put off by the laser in operation. 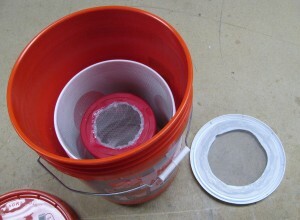 This entry was posted on Monday, March 19th, 2012 at 7:07 pm and is filed under Quick Projects. You can follow any responses to this entry through the RSS 2.0 feed. You can leave a response, or trackback from your own site. Good overall design and points for not fabricating parts that are cheaper to buy. One of the overlooked aspects in Adsorption systems is the reverse part of such processes. Everything that gets captured will eventually both saturate the medium’s capacity and be released when conditions favor release. That’s a major gotcha for the unwary. The carbon pack will at some point be so supersaturated by nasty volatiles that it WILL outgas them under forseeable operating conditions. Which mandates a planned “Purge Cycle: to manage those volatiles. Either doing so at a place in an exhaust airstream or feeding into a combustion process. I’d suggest considerations of transporting saturated Adsorbers to where a burner will be running for either space heat or metal heating operations that would be above the destruction thresholds for such volatiles. Even though the heat gain will be negligibly trivial and not a value consideration, feeding vapors through a burner is one of the best potential harm mitigation methods. There’s also the non-trivial risk from carbon dust explosions being initiated by low flash point chemicals in such canisters, Ignition sources potentially being when purging into an afterburner or just arcing from motor brushes- and yes..static discharges from airflow.